Isabelle Ferreras is a tenured fellow (Checheure qualifiée) of the Belgian National Science Foundation (F.N.R.S., Brussels). She is a professor of sociology at the Université catholique de Louvain (Louvain-la-Neuve, Belgium) where she teaches at the Department of Social and Political Sciences, at the Institut des sciences du travail and at the Economics School of Louvain. Isabelle is involved as a permanent researcher of the CriDIS (Centre de recherches interdisciplinaires Democracy, Institutions, Subjectivity). Since 2004, she has been an associate of the Labor and Worklife Program at Harvard Law School (Cambridge, MA) where she is now a Senior Research Associate. In the Spring 2017, Ferreras was elected a member of the Royal Academy of Sciences, Humanities and the Arts of Belgium, Class Technology and Society. Isabelle Ferreras holds a PhD in sociology from the University of Louvain (Doctorat, Louvain, 2004) and a master of science in political science from the Massachusetts Institute of Technology (MSc, M.I.T., Class of 2004). She is also an alumnus of the Harvard Trade Union Program (Certificate, Harvard University, Class of 2005). Outside Louvain where she has held a series of both scientific affiliations (CPDR 1998-2000, Hoover Chair of economic and social ethics 2001-ongoing, CriDIS 2005-ongoing) and teaching positions (Department of Political and Social Sciences, FOPES, Institut des Sciences du travail), Isabelle held research appointments at the University of Wisconsin-Madison (visiting scholar 2000), the Department of Political Science at M.I.T. (visiting scholar 2003), the Minda de Gunzburg Center for European Studies at Harvard (Graduate Student Affiliate 2003-04, Affiliate 2004-05), the Hanse-Wissenschaftskolleg in Germany (research fellow 2006-07), and teaching appointments at Harvard university (teaching fellow at the College in the Core program, 2004) and the university of Bremen (DAAD visiting professor at the Bremen Graduate School of Social Sciences, 2007). Since 2004, she has been an associate of the Labor and Worklife Program at Harvard Law School (Cambridge, MA) where she is now a Senior Research Associate. Since 2005, Isabelle has been a member of the PayWizard / Wage Indicator Project, coordinating the PayWizard team in the United States (ongoing). 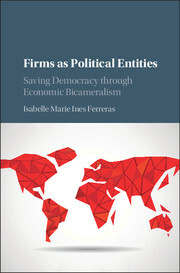 Isabelle Ferreras is an active member of the Society for the Advancement of Socio-Economics (SASE). Between 2007 and 2013, Isabelle Ferreras was involved as a Society for the Advancement of Socio-Economics (SASE) network organizer for the network K Law and the Social Sciences with Katherine Stone (UCLA) and Alvaro Santos (Georgetown University). In June 2012, she was elected to the Executive Council for a 3 year term, then re-elected once. She is serving now a SASE network organizer. Launched in January 2016 at the M.I.T. Endicott House, Isabelle Ferreras coordinates the Endicott/Dictate.me.not Society, an international collaborative research effort on the Political Dimensions of the Globalized Firm. Ferreras serves as a reviewer for a number of journals in the fields of labor relations, sociology, political theory, economic philosophy. 2016-ongoing : Université Paris VIII. Min Zhang“Secular Stagnation and the fourth Industrial Revolution.” PhD dissertation in economics. co-chair with prof. Arnaud Orain. 2016-ongoing : Université catholique de Louvain, Olivier Jégou, “Les entreprises libérées: voie managériale vers la démocratie d’entreprise ? Études du pouvoir en contexte participation directe des travailleurs” co-chair : prof. Laurent Taskin.PhD Program in Political and Social Sciences. Université catholique de Louvain,Nicolás Orellana Águila (Becas Chile Conycit), “Changement social en Argentine et au Chili. Luttes, conflits, mouvements sociaux.”, Bernard Francq (chair), advisors : Isabelle Ferreras, Danilo Martuccelli (CERLIS Paris-Descartes). PhD Program in Sociology. Defended on May 28, 2017. CNAM, Paris, Maëlezig Bigi, « Reconnaissance et organisation du travail. Perspectives françaises et européennes » (dir. Dominique Méda and Michel Lallement) PhD dissertation in sociology, External member of the jury. Defended on December 5, 2016. Sciences Po, Paris,Hadrien Coutant, « Un Capitalisme d’ingénieurs. Construire un groupe aéronautique après une fusion » (dir. Pierre-Eric Tixier), PhD dissertation in sociology, Rapporteur. November 28, 2016. Université catholique de Louvain, Céline Donis, « De l’intérêt d’une lecture territoriale pour appréhender les dynamiques de transformation des espaces de travail : une perspective critique et politique en management. »PhD dissertation in sciences du travail (Work and Employment studies). External member of the jury. Defended on July 10, 2015, Mons. Sciences Po, Paris, Emmanuelle Marchal, “Les incertitudes sur la valeur des candidats. Contribution à la sociologie du marché du travail” (dir. Prof. Didier Demazière). Member of the HDR (Habilitation à diriger les recherches en sociologie), Jury November 15, 2013. Université catholique de Louvain,Priscilla Claeys (PAI Fellow),“Claiming Rights and Reclaiming Control. The Creation of New Human Rights by the Transnational Agrarian Movement Via Campesinaand the Transformation of the Right to Food”, co-chair: prof. Olivier De Schutter. PhD Program in Political and Social Sciences. Doctorate granted on February 19, 2013.